Giants like Google and Facebook thrive[sta_anchor id=”bottom” class=”semibold”] on personal data. [/sta_anchor] In exchange for a list of your likes and topics you search for, they can offer a smarter and more personalized experience. The problem? Most Americans don’t trust big tech to do what’s right with personal data. A study by Pew Research found only 24% of people think big companies are doing enough to protect user information. The problem? Most Americans don’t trust big tech to do what’s right with personal data. A study by Pew Research found only 24% of people think big companies are doing enough to protect user information.The problem? Most Americans don’t trust big tech to do what’s right with personal data. A study by Pew Research found only 24% of people think big companies are doing enough to protect user information.The problem? Most Americans don’t trust big tech to do what’s right with personal data. A study by Pew Research found only 24% of people think big companies are doing enough to protect user information.The problem? Most Americans don’t trust big tech to do what’s right with personal data. A study by Pew Research found only 24% of people think big companies are doing enough to protect user information.The problem? Most Americans don’t trust big tech to do what’s right with personal data. A study by Pew Research found only 24% of people think big companies are doing enough to protect user information. That unease intensified this week when an AP investigation showed Google may be storing your location information, even when you ask it not to. The search behemoth does offer a second step to opt out of location tracking, but it’s strangely hard to find, raising major questions about why the feature wasn’t built in a more transparent way. It’s better to build—rather than rebuild—customer trust. And when it comes to data collection, startups that are still developing their standards and practices may have the best shot at building strong customer relations, rooted in trust and security. Take companies like DuckDuckGo. Launched in 2008, the search engine alternative stands on a unique principle: What’s good for Google may not be what’s good for everyone else. 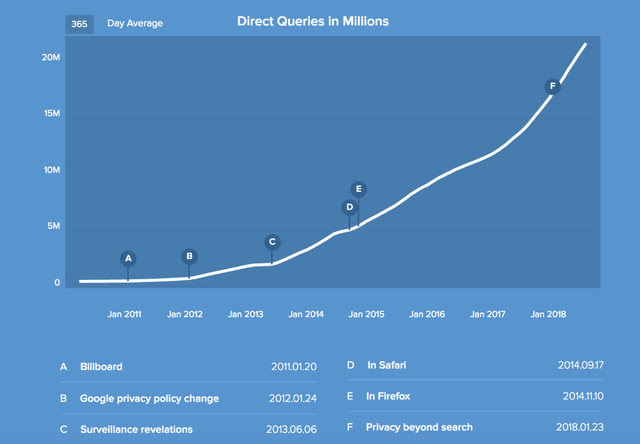 So its founder built a business on the idea that search engines shouldn’t track user search history—and it’s survived to tell the tale. DuckDuckGo now processes more than 20 million queries a day, and while that’s only a fraction of the 3.5 billion searches Google gets, DuckDuckGos’ growing adoption is hard to ignore. It also reminds us there’s a major set of online users opting for privacy over personalization. So why isn’t data usage more transparent across all companies? The U.S. still has no central, comprehensive law to govern data collection. That means big tech companies can continue making ethically ambiguous choices in pursuit of growth. It also means, in this environment, that those who are transparent about their data use have an opportunity to stand out.